Navigate: StoreFront / Closeouts / WoHo Flying Fender (Black) Closeout! WoHo Flying Fender (Black) Closeout! Ride With Style And Avoid The Stripe! Easily mounts to seatpost or seattube of most bikes using specially designed reusable hook/loop. 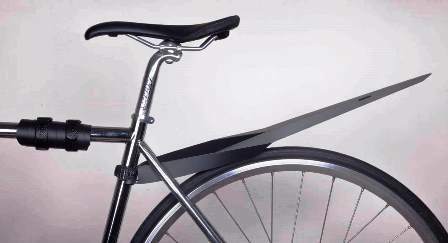 Flying Fender 2 is extra wide and long with flared edges that keep the stripe off your back during wet weather. *Manufactured of non-toxic recyclable material. *Fits rear or under downtube for front. *Easy to install-no tools required. *Weighs less than 50 grams including hook/loop straps. *Can be rolled around seatpost or frame for storage. *Easily fits in your pocket or backpack. From Arthur Berger of Leawood, Kansas on 9/2/2014 .